Funnel Cake with candy-caramel apple compote, cotton candy and French vanilla creme. What: The Tavern on the Square, an upscale yet casual mountainside bar and restaurant. Where: 675 Lionshead Place, Lionshead Village, Vail. Cost: Munchies and shares $16-26; mains $13-39. Signature dish: Island Poke Bowl with sticky rice, kimchi, chili mango salsa, pickled ginger and choice of protein. More information: Call 970-754-7704 or visit www.thevailcollection/tavern-on-the-square. Editor’s note: This article was previously published as a paid feature in EAT, a compendium of restaurant snapshots featuring the best in Vail Valley dining. Look for it on newsstands everywhere. Ski over the bridge just past the Eagle Bahn gondola and glide your way through the doors of Tavern on the Square, located at the base of the Arrabelle Hotel and just steps from the plaza’s ice rink in Lionshead. Don’t be fooled by the name, this tavern is anything but the traditional dark-wooded pubs of the past: Think gastro-pub with over 60 menu items awaiting those in need of a few moments off the hill. While people-watching through the oversized picture windows, partake in one of the Tavern’s signature cocktails created by premier mixologist Matt Devine, such as the Painkiller featuring Ron Zacapa 23-year-old aged rum, pineapple juice, coconut cream and nutmeg. Enjoy any of his libations and walk away feeling better than when you came. Pulling international influences all the way from London and adding to the menu some alternate dishes with Asian flare, the Tavern actually has 6 eclectic menus to cater to its different guests: gourmet breakfast, spa/gluten-free and pet menus complement the lunch, après and dinner menus. 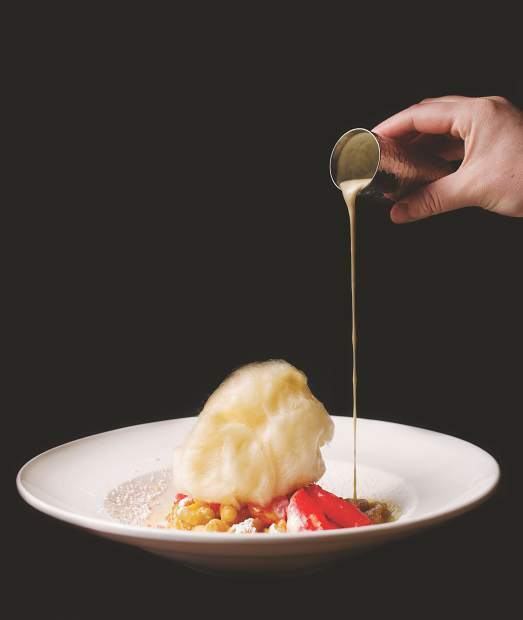 “That’s why we can have ramen and poke on the menu right next to our chicken pot pie,” Chef Wade remarks with a wry grin. The Island Poke Bowl with pickled ginger, chili mango salsa, crispy glass noodles, and yuzu shoyu sesame dressing over sticky rice and kimchi is coupled with guest’s choice of ahi tuna, crispy tofu or even unagi (freshwater eel). The poke bowl has become one of the Tavern’s most popular and requested dishes. Sticking on the lighter side, the winter beet salad with smoked duck and crumbled chèvre is a delightful trip for the tastebuds. Appetizers and munchies ranging from fried octopus to a wild boar quesadilla paired with tangy red pepper relish has the ability to tempt the tongue and satisfy the soul. For those in need of a meatier selection, the bison burger or ale-braised lamb shank might do the trick. The Wapiti Elk with a coffee-cured elk loin and foraged wild mushrooms, roasted tomatoes and sage sausage is not to be missed and will easily change the hungry to happy in no time at all. A new Market Menu, changed weekly, features local craft brewers, distillers, farms, fisheries, dairies and ranchers. Ask to see the special menu. Before heading back outside, stay just a few minutes longer to enjoy one of the Tavern’s notably playful desserts. The sweet treats of peanut butter trifle or “S’mores Crack Jar” will definitely leave anyone on a sugar high. The sugar-laced funnel cake topped with fire-engine red candy caramel apple compote will bring back childhood memories as the cotton candy melts away under the French vanilla créme. Pure satisfaction.